I don't think dogs hide their evidence very well. Always going to be at least traces of blood on the dog fur. Teeth leave bite marks. Any dog that bites will probably be described as a Pit Bull. And no victim will admit they threatened the mutt. "According to dogsbite.org, on average nearly two thirds of all fatal dog attacks in the U.S. are committed by pit bulls." " "There's four big *** pit bulls killing this girl. They're killing this woman, and we're trying to get them off her." If it involves a pit bull it makes the papers then you count up the stories in the papers and what do you know, pit bulls stories predominate. All the loving pit bulls who protect and entertain young children never get publicity for it. Every one of these maulings had loving pit bulls, until they went psycho. Even my neighbor, just before her dog killed mine said her dog had never bitten before. They don't until they do. Link above points out, pitbulls are responsible in 75% if canine killings. Doesn't say how many maulings they are involved with. I still haven't made up my mind on this one but lean towards no special rules for pit bulls. I've met several and they seemed like nice dogs to me. 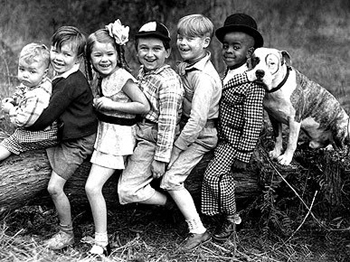 Petey, the dog on the Little Rascals, was a pit bull. I will say that if any dog bites someone, other than in an act of the legitimate defense of his owners or their property, that dog should be destroyed on the first offense for a biting involving drawing blood and on a second offense for more minor bites. Breed should not matter. Depending on the circumstances, the owners should be help liable both financially and criminally for what their dog. As I understand it, at least in California, this is more or less the law. However, this is not my strong suit. This topic hits a nerve because I was bitten by a small dog when I was in kindergarten and still remember it vividly. The owners fell all over themselves apologizing and bought me a nice Hot Wheels set. My mother must have gone there and raised holy hell as only a woman can, which she should have. I was also chased down by a dog in Seattle, when I was around 10 or 11, but it turned back. In both incidents, I'm sure the dog thought it was protecting its property, but I was on the sidewalk both times.